Cattle ranch numbers have been decreasing over the last decade, along with the number of processing facilities. After the closing of a large feedlot and slaughter plant on Oahu in 1991, weaned calves began to be shipped to the U.S. mainland and Canada to reach their sales weight as a way to cut costs. 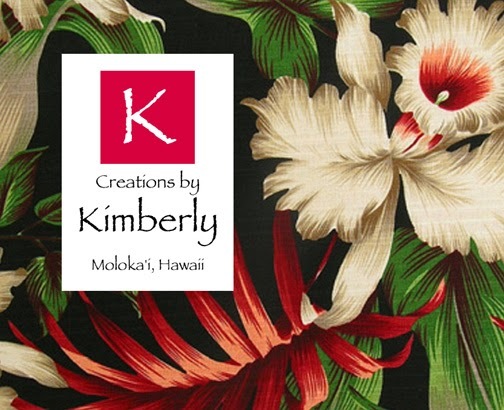 By 2003, the industry reported that approximately three-quarters of cattle marketed in Hawaii were exported, according to the Hawaii Agricultural Statistics Service. However, this business model exposed Hawaii’s ranchers to volatile corn prices, which in recent years, made this approach less and less profitable. Therefore, there is widespread industry interest in grass-fed beef for local consumption as a path to more reliable profits. The Big Island produces the majority of Hawai'i's grass-fed beef, and is sold to restaurants and retailers. A handful of ranchers sell direct to consumers or at farmers markets. Despite the fact that agriculture has struggled to survive and thrive in Hawaii, it is testimony to the strength of our culture that we find ranchers, farmers, processors and educators all working together to form partnerships that will provide a more self-reliant and sustainable future for our community. 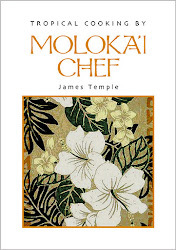 The island of Moloka'i also raises a small amount of grass-fed beef, which is processed at Moloka'i Livestock Cooperative (MLC). They are part of a national movemet to process only hormone-free, grass-fed animals, which is driven mainly by consumer awareness. While the average meat-packing plant on the mainland will process between 3,000 to 5,000 heads per day, MLC averages about seven per week. 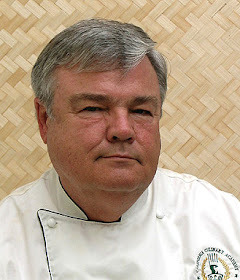 Operating at a smaller scale allows MLC to provide the island and a few off-island vendors with high-quality meats. 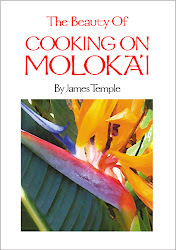 The Moloka'i Livestock Cooperative is located at 3367 Mauna Loa Highway, in Ho'olehua, on the way to the west end of the island, just before the airport on the left side. They are open Monday through Friday from 7 a.m. to 3 p.m. For more information, call 567-6994. In addition to beef, MLC also processes other meats like venison, sheep, and hogs. Add soy sauce, ginger, garlic, brown sugar, pineapple juice and apple cider vinegar to a small pot. Bring to a boil then simmer over low heat for 2 minutes. Remove from heat, let cool and pour the marinade into a zip lock freezer bag. Add steaks into the zip lock freezer bag with the marinade. Cover and place in fridge for 1 hour. Flip sides and cover for another 1 hour in the fridge. 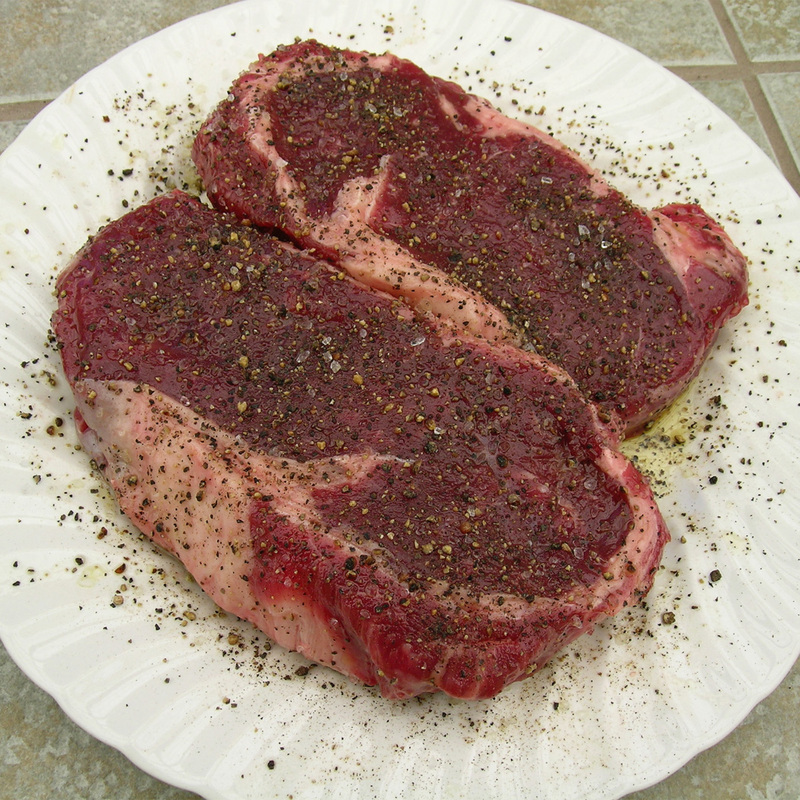 20 minutes before starting the grill, take dish with steaks out (still covered) to cool to room temperature. Heat grill. Heat grill to high and grill steaks for 5 minutes. Flip and continue to grill for 4 minutes (for medium-rare to medium). Use an internal thermometer (135˚F for medium-rare and 140˚F for medium). Transfer steaks to a platter and tent with foil to let rest for 5 minutes. Serve with grilled asparagus and sweet potato fries. Makes 2 servings. Note: This recipe also works well with pork tenderloin. There are times when char-broiled steaks are just not convenient, and I have to say that this recipe is just as good, easy, and works every time. Bring the steaks to room temperature. Rub the steaks with 1/4 teaspoon oil per side and generously season with salt and pepper. Preheat oven to 500˚F (a very hot oven produces a juicy interior). Place a 10-inch ovenproof skillet or cast-iron skillet in the oven as it preheats. When oven reaches 500˚F, use a baking mitt to remove the pan from oven. Be careful! The pan and handle will be extremely hot. Place the pan on the stovetop and turn the heat to high. Immediately place steaks in the middle of the hot, dry pan. Cook 1 to 2 minutes without moving; turn steaks with tongs, and cook another 1 to 2 minutes. Transfer the pan with the seared steaks to the hot oven. Roast in the center of the oven until the steaks are cooked to your liking, about 3 to 5 minutes. Use a meat thermometer to test for doneness. Transfer the cooked steaks to a warm platter and tent loosely with aluminum foil. Let meat rest for 5 to 10 minutes before serving. During this time the meat continues to cook (meat temperature will rise 5 to 10 degrees after it is removed from the oven) and the juices redistribute. While the steaks are resting, place the skillet over medium heat. Add 1/2 cup dry red wine to the skillet and bring to a boil. As the wine boils, use a wooden spoon to scrap any brown bits off the bottom of the pan. Let the liquid boil until reduced to approximately 1/3 cup. Remove pan from heat. Add the butter, swirling the pan to incorporate it into the sauce. Serve the steaks whole or slice thin and fan onto individual serving plates. Pour the sauce over the steaks just before serving. Makes 2 servings. I have cooked this delicious roast many times for my family, and it turns out great every time. I have tried other cuts of beef but keep coming back to Tri-Tip because of its flavor. Crush the thyme, oregano, rosemary, garlic powder, black pepper, and cayenne pepper together in a mortar and pestle, or between your fingers. The important thing is to get everything thoroughly mixed and crushed together. Pat the mixture all around the sides of the trimmed meat. When ready to cook, sprinkle the roast with the salt. Heat the oil in a heavy ovenproof skillet, I use my large iron skillet. When hot, add the meat and cook over medium to high heat for 3 minutes on each sides. Then transfer the roast to a preheated 450˚F oven and cook for 8 to 10 minutes for medium rare. Add the heated stock and let rest, covered with foil on your stovetop for 10 minutes before carving. I like to cut Tri-Tip fairly thin across the grain because sometimes it can be a little tough. After carving the roast, add any of its juices to the hot stock. Serve with the natural meat cooking juices. Great served with mashed potatoes, and boiled carrots rolled in butter and basil pesto. Makes 4 servings. Combine all of the marinade ingredients in a bowl and mix well, set aside. Rinse meat, pat dry and place in a large heavy zip-lock bag. In a small bowl, mix together 1/2 of the marinade, garlic, pepper and wine. Pour marinade over meat in zip-lock bag, close and refrigerate overnight, turning bag once or twice. Discard marinade and pat meat dry. Grill over low, direct heat until internal temperature reaches 120˚F (about 30 to 40 minutes), turning 1/2 way. Remove from grill and allow to rest for 15 minutes (internal temperature will rise to 130˚F to 135˚F for medium rare). Adjust cooking time accordingly for preferred doneness. Slice thinly across the grain at a slant and serve with remaining marinade, heated. Makes 6 servings. Salt and pepper London Broil pieces and dust with flour. Heat oil in a large, high sided, oven proof skillet and brown London Broil 2 minutes on each side with onions and fresh mushrooms. Remove from heat and place chopped carrots around London Broil. Mix tomato sauce, cream of mushroom soup, garlic, Italian seasoning and 1 1/2 cans of water in saucepan. Pour over meat. Bake for 1 1/4 hour at 350˚F. Remove from oven and add potatoes and green pepper. Bake another 3/4 hour at 350˚F. During this time trim and blanch beans for 10 minutes in salted water without the lid on. When meat is cooked, remove and thinly slice into bite sizes pieces and return to pan. Now add cooked beans to pan and mix to coat beans with sauce. Serve with crusty French bread and a green salad. Makes 6 servings. In a small bowl, combine oil, garlic, salt, pepper, paprika, rosemary, onion, and thyme. Rub the roast all over with this mixture and let rest, covered with plastic wrap, in the refrigerator for about 2 hours. One hour before cooking the beef, remove from refrigerator to allow it to come to room temperature. Heat oven to 325˚F. Heat a cast iron or oven proof skillet on high. After about a minute, place roast in the hot skillet and brown meat for about 2 minutes per side. Pour heated beef stock and sliced mushrooms around roast, and cover tightly with foil. Bake for about 3 hours or until meat is fork tender. Remove roast to a cutting board and keep warm by covering it with foil for 15 minutes before carving. Meanwhile, pour drippings and mushrooms into a saucepan. Combine cornstarch and water until smooth; gradually stir into drippings. Bring to a boil; cook and stir for 2 minutes or until thickened. Taste gravy and season with salt and pepper if needed. Serve sliced beef and gravy with mashed potatoes, and asparagus. Makes 4 servings. Mix bell pepper and cucumbers in large bowl; set aside. Combine lime juice, soy sauce, sugar, basil, mint and ground ginger in small bowl; set aside. Spray large skillet or wok with cooking spray; heat over medium heat 1 minute. Add jalapeno peppers, grated ginger and garlic; cook 30 seconds, stirring constantly. Stir in steak; cook 3 to 4 minutes, or until cooked through, stirring frequently. Add to bell pepper mixture; mix lightly. Set aside. Add lime juice mixture to same skillet. Bring to a boil, stirring occasionally. Boil 30 seconds. Divide greens among 4 salad plates; top evenly with the steak mixture. Drizzle with the lime juice mixture. Makes 4 servings. Grill top sirloin until it is medium rare. Combine sauce ingredients. Heat pita bread in a 300˚F oven for 5 minutes. Cut pita bread in half with a bread knife, and carefully open each without tearing the bread. Stuff pita halves with thinly sliced steak, tomato, onion and lettuce. Spoon sauce into pitas. Serve immediately. Yield: 4 servings of two steak pita pockets each. I have been eating this dish since I was a small child. My father owned a hotel that had a German chef. He made this hearty dill pickle dish that I have been enjoying for years. In a large skillet, saute onions in 2 tablespoons of oil until tender; remove with a slotted spoon and set aside. Pound steaks to 1/4-in. thickness; sprinkle with salt and pepper. Spread with mustard and top with onions. Place a pickle at one short end and a bacon strip lengthwise on top. Roll up jelly-roll style; secure with toothpicks. Set aside 1 tablespoon flour for thickening. Coat the roll-ups with remaining flour. In the same skillet, cook roll-ups in remaining oil over medium heat until browned on all sides. Add the water, bouillon, thyme and bay leaf. Bring to a boil. Reduce heat; cover and simmer for 30 minutes or until meat is tender. Discard bay leaf and toothpicks. Remove roll-ups and keep warm on a platter covered with foil. Combine butter and reserved flour; add to the pan juices if you want the gravy to be thicker. Bring to a boil; cook and stir for 2 minutes or until thickened. Meanwhile, prepare your Dill Dumplings: Briskly mix together 2 eggs and 1 cup milk. Gradually add 3 cups flour, baking powder, salt, and 1 tablespoon chopped fresh dill. The dumpling batter will be very soft and sticky. By now the broth should have thickened; drop dumpling batter in heaping tablespoons into boiling sauce. Cook for five minutes, then turn each dumpling over with a spoon and allow to cook an additional 5 minutes. Remove dumplings to platter with roulades and serve with cooked carrots; either pour remaining sauce over roulades and carrots or serve alongside in a gravy boat. Makes 6 servings. Aioli sounds Hawaiian, but it isn't. Actually aioli is a traditional condiment from a region in southeastern France on the Mediterranean adjacent to Italy. This is olive oil country, and this classic sauce is typically made with olive oil, garlic, lemon juice, and egg yolks. It's basically a garlic mayonnaise. Cooks have been changing the flavor and color of the basic recipe by adding other ingredients to create their own spin on aioli, example: chipotle aioli, lemon aioli, whole grain mustard aioli, chive aioli, basil aioli, etc. etc., but my favorite aioli is "Fire Roasted Red Pepper Aioli". There's something about the roasted flavor of sweet red peppers and garlic, and the beautiful creamy salmon color the peppers add. It's very easy to roast red peppers at home, but if you don't want to bother with it, you can buy roasted red peppers in a jar. I like to roast my own, because it makes my kitchen smell good and I think the sauce tastes better. 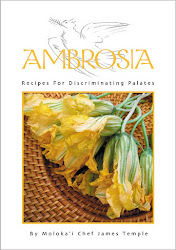 Once the sauce is made, you can use it as a dip for boiled artichoke leaves or as a spread on fried green tomatoes (my southern roots), on mahi mahi fish sandwiches or fish tacos, or on crispy crab cakes instead of tartar sauce, spread on toasted baguette slices as a snack, over boiled parsley potatoes, with grilled lamb or steak, along side raw or steamed vegetables as an appetizer, on top of a meat loaf sandwich, and it's even great served with scrambled or poached eggs. It's a good idea to eat aioli with close friends because the garlicky aroma will follow you around for a few days, but that never really bothered me, all of my friends love garlic. 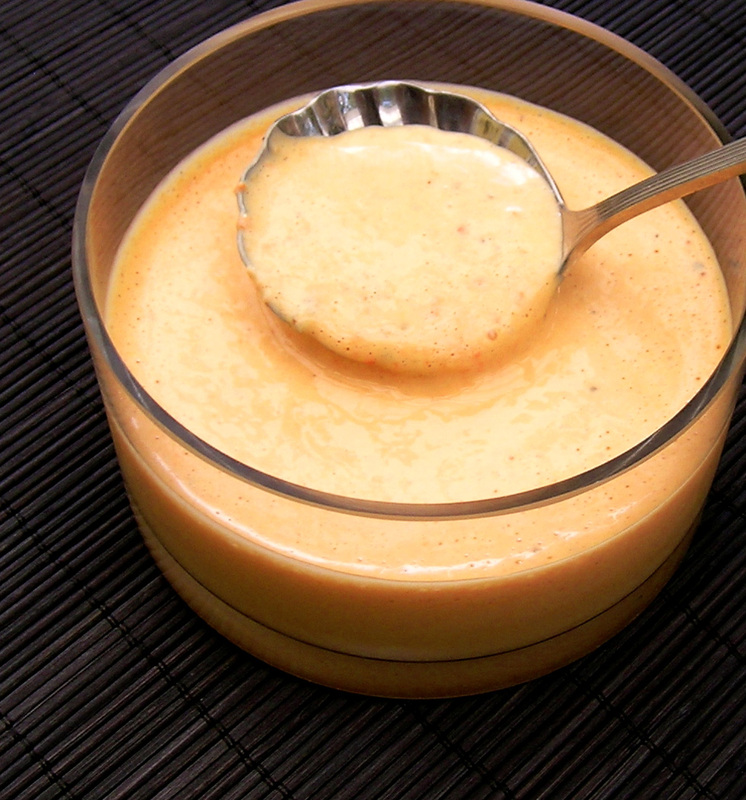 This aioli sauce is similar to a French red pepper rouille sauce (pronounced roo-EE). The word means "rust" in French, a reference to its color. Like aioli, rouille is also a Provençal sauce, with roasted red peppers, crumbled saffron threads, anchovies, cayenne pepper, fresh bread crumbs, and red wine vinegar, all blended together and served for fish dishes, fish soup and bouillabaisse. My aioli is simpler to make and can be used with a wider variety of dishes. I think you will like it, but feel free to vary the recipe to your taste. The simplest way to roast a red bell pepper is to turn your oven broiler to high and place an oven rack 4 to 6 inches below the heating element. Place a small piece of foil on the rack and top with the red pepper. Broil until charred on all sides, turning with tongs. Place the charred pepper on your kitchen counter and fold the foil over it creating an air tight seal. This keeps the heat in and actually steams the blackened skin so it's easy to remove. When the pepper is cool enough to handle, about 5 minutes, remove blackened outer skin, veins, and seeds, but don't rinse the pepper in water. 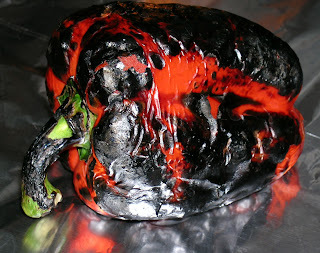 I like to leave a little of the black skin on the roasted pepper, it adds a lot of flavor to the sauce. Chop the roasted pepper into chunks. Roasting the garlic makes it milder and sweeter. 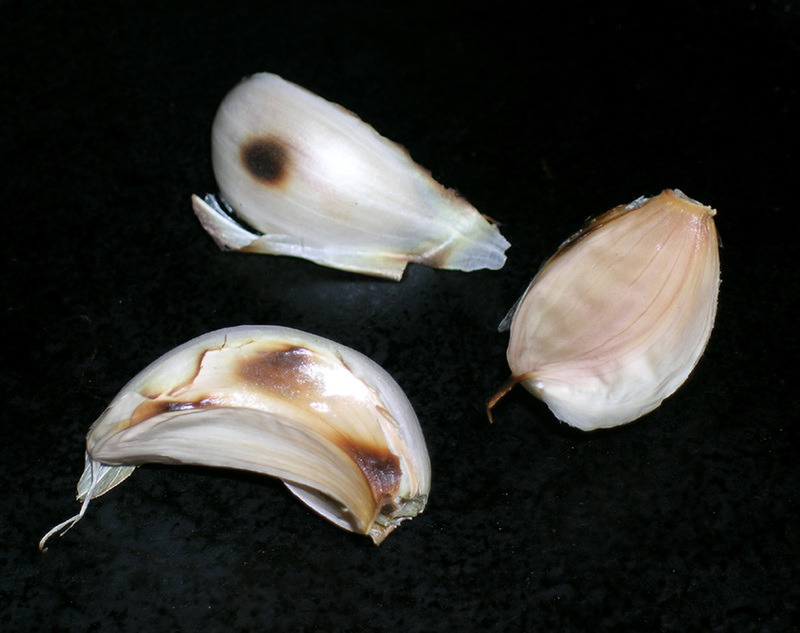 Place garlic cloves in a frying pan (I use my iron fry pan) over medium heat, and roast, without pressing, until just browned on all sides. Remove garlic cloves and set aside. When cool enough to handle, peel garlic. In the bowl of a food processor, purée the peeled roasted garlic. Add the red pepper chunks and blend until almost smooth. Add mayonnaise and olive oil, and cayenne pepper, if using, salt, and pepper to taste; pulse to combine. Transfer the aioli to a small bowl. (The aioli can be made 2 days ahead. Cover and refrigerate.) Note: If you want the sauce to be a bit more sour, add a little lemon juice and or capers. Makes about 1 cup.